BMX Old School Merida: X-Files of Rick Allison..!!! Sponsors: In order of sponsorships: GT bicycles. Mongoose. Hutch. Haro. Vuarnet Sunglasses, Rector clothing. Quicksilver, Vans, Converse, Bell, Swatch, MOM N DAD. Destination: Favorite was living in Germany back in 89 for a year. Favorite Movie: The Star Wars (Trilogy). Favorite Color: '69 Chevy huger orange. Favorite Bike Company: When I lost my sponsor due to the fall of our sport... Haro came to my rescue and Co-sponsored me... for 7-8 yrs... I owe them ...they're my favorite cool life changing company. My Favorite Contest: had to be one of the original pipeline contest of say 1984-5... I never knew a guy could get 9' of air outa a bowl... Eddie Fiolia, Mike Daminguez, Blyther, and Sigur owned it that day... ramps are not skate parks ...that day (contest) was life changing for me. 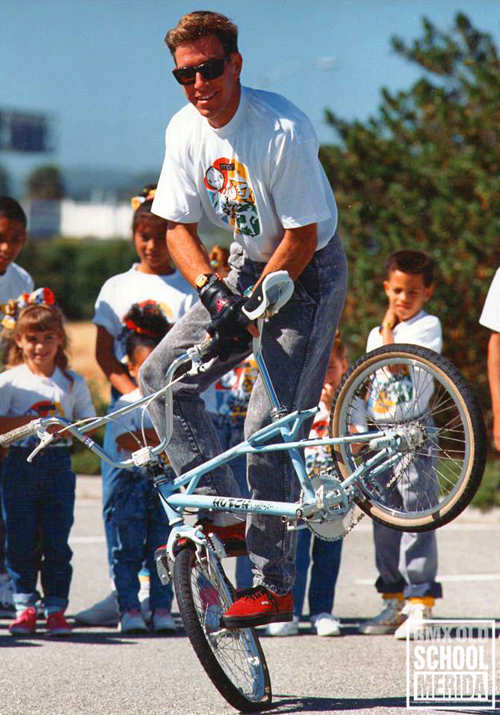 Magazine: BMX Action (Cause they changed the face of BMX racing and Freestyle). My 1st ever photo in a mag was a Vander-roll in Actions take outs. Party: New years eve parties: All of 'em!